Eight men stand around a body and await the arrival of the witness. William Harker enters and relates the tale of how his friend, Hugh Morgan, died. He watched him savagely mauled by an unseen horror. This story does a lot with very little. Whereas The Great God Pan left everything to the reader's imagination, this tale gives us a description of the attack and its grisly aftermath, but leaves the creature out of sight. William Harker is a writer and a friend of Hugh's. He witnessed his death and cannot explain the shadowy force that was barely visible between them. Hugh Morgan is a grizzled mountain man who encounters the thing when he notices his dog barking and sees a shadow in the distance. 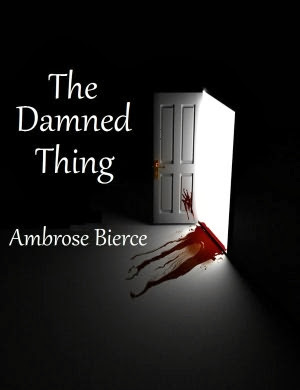 The Damned Thing is a creature that exists as a terror to those who live near nature. The creature is more metaphor than terror, but it is a thought provoking antagonist. The isolation in Hugh Morgan's section gives the feeling of being stranded in the mountains. Excerpts from Hugh's journal end the tale as he describes his mounting fear. At the very end, he makes some suppositions on what the thing might be and the nature of its existence. A solid tale that provides interesting food for thought. It serves more as a parable than a horror story with some cool imagery and ideas. Read it if you like fantastic concepts. Read it for free on Project Gutenberg and Kindle!